Honey who shrunk the kids? After an impassioned three-month Occupy drama Hong Kong students dramatically scale down horizons and snub international causes. Is this the end for a muddled movement? Or a new beginning? 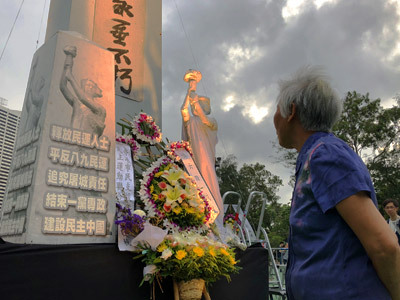 THE evening drizzle that had set in dampened none of the enthusiasm of the 115,000-strong crowd that had gathered in Hong Kong's Victoria Park attending a 4 June remembrance of the 1989 Tiananmen Square crackdown. As speakers and bands took their turn on a wet stage, hundreds of earnest young faces came alight in the glow of candles held fervently aloft. They sat quietly, some with parents, as mourners bowed repeatedly before an illuminated memorial, tears streaking many faces. Looking at the wheelchairs and prams – mothers, fathers, grandfathers – it was evident that this gathering was an intergenerational mark of solidarity. Yet, incredibly, the main beneficiaries of this public outpouring were conspicuous by their absence. Gone were the student leaders who had vociferously flirted with a whirlwind of causes from democracy and localism (favoured by a great many in Hong Kong) to more fanciful and less popular ideas of independence and self-determination. They were the driving force behind the remarkably peaceful if unproductive Occupy protest in late 2014 that brought the city to a grinding halt. Has the sun finally set on the Hong Kong student movement? The decision two years ago to split from the mainstream 4 June rally is an odd turn of events. Student movements the world over have been naturally supportive of global struggles – especially those by fellow students waving clenched fists at capitalism or globalisation. Support for imperilled democracies is always readily forthcoming. The Internationale, a rousing anthem of the left since the nineteenth century, has been sung in this city – and not just by budding Marxists – where it has been a torment for authorities to coax the Mainland national anthem out of unwilling tongues. At the 4 June 2014 rally, Alex Chow Yong-kang of the Hong Kong Federation of Students told the crowd that Hong Kong and China were one in their struggle. “Beijing students exercised civil disobedience to occupy Tiananmen Square. Don’t they share the same belief as Hongkongers today who float the idea of Occupy Central?" So why has the Hong Kong student movement performed an abrupt volte-face and abandoned an assembly patently tailor-made for it? One answer lies in its growing focus on localism. This means different things to different people. For some, it requires a shrinking of the political space into something clearly defined and manageable and with a direct relationship to Hong Kong, a regrouping of forces and a new agenda. Sensible perhaps, but it comes at a significant cost – an absurd declaration by student leaders that they are no longer concerned with the nurturing of democracy in other countries or expressing solidarity with worldwide movements. In June 2016, Paul Liu Chun-sing of the Hong Kong Federation of Students made the astounding revelation that a democratic China would spell the end of Hong Kong's special identity as this territory would then be the same as Shanghai, Guangzhou or Shenzhen. While this thinking is wrong on almost all counts, it reveals both political naivety and a deep nagging fear. Student leaders know they lost a remarkable opportunity for a mainstream voice when the oath-taking antics of their elected tyros cost them legislative council seats while gaining little save for public derision and prison time. With popular support for their extreme demands waning, the students have rightly decided to focus on developing political awareness amongst the citizenry through seminars and the building of a network ground up. Quite chuckleheaded though is the assumption that their movement can survive in a vacuum. It's like developing a tiny intra-net for your iPhone then disconnecting from the global Internet. Boycotting a rally that holds genuine meaning for many – while rubbishing student sacrifices elsewhere – has also alienated the very people whose support provided the oxygen that enabled the umbrella movement to run on for three months. Uninspired and erratic leadership has also soured student interest in activism and union participation. Perhaps the time has come to find fresh champions. Student awakening is a rite of passage that energises the family, society and polity. The more robust the discussions – howsoever unappealing to elders or politicians – the better it is for society as a whole. It permits a safe venting of steam and often throws up novel and unusual ideas for resolving problems. Youthful passion is an endless fuel that drives society forward. And it must draw inspiration from the world, not just Causeway Bay. The disparaging argument that student movements are simply an Oedipal clash with the authority figure of the State, is debatable. It is a fact that since the 1960s and 1970s, young people around the world have taken to the streets for a number of causes ranging from academic malfeasance and declining standards (local issues) to winning jobs and ending wars (international causes), with surprising results. The 1970 Kent State University Ohio shootings by the National Guard lit the tinder that saw anti-war student protest explode across the USA. It ended the Cambodian invasion and, eventually, saw America pull out of Vietnam. In Iran in July 1999, the closure of a reformist paper saw police clashing with students at Teheran University. The short-lived ensuing street battles that spread to other cities garnered much popular support and sparked the birth of a vibrant student movement. South Korean students have taken to the city streets since the '60s to fight for democracy. The ferocity with which the May 1980 Gwangju Uprising (a protest against the unpopular government of military strongman Chun Doo-hwan) was put down shocked the world and eventually helped pave the way for civilian rule by the 1990s. This pales when compared with the Thammasat University massacre in Bangkok on 6 October 1976 in which scores of students were killed when the police sealed the university to pour in withering fire aided by right-wing paramilitary thugs who shot and killed students as they leaped into the river to flee. After a brief flirtation with democracy the country's leaders, by then worried about the rise of Communism in Southeast Asia and the fall of South Vietnam, had recalled the much reviled Field Marshall Thanom Kittikachorn, thus setting up a bloody confrontation. In India, student idealism led some to fight against rural landlordism in the seventies (alongside left wing Maoist Naxalites) while in 1977 students played a major role along with political activist Jayprakash Narayan to evict the hated Emergency imposed by Prime Minister Indira Gandhi and to launch 'total revolution' against official corruption. Student movements the world over – when they won, or even when they spectacularly failed – have left an indelible mark on society, culture, and politics. Huge sacrifices have been made. It is the prerogative of youth to show no fear and dream of an eternal tomorrow. It is a tragic departure from the universal script then to see Hong Kong's student leaders opting for intellectually crippling solitary confinement. Broad horizons offer broadened experiences and life-changing opportunities. As Che Guevara the sometime medical student and budding revolutionary wrote in his Motorcycle Diaries after adventuring across South America, “I began to come into close contact with poverty, with hunger, with disease, with the inability to cure a child because of a lack of resources… And I began to see there was something that, at that time, seemed to me almost as important as being a famous researcher or making some substantial contribution to medical science, and this was helping those people.” Clearly, not all human beings are selfish.